When my kids started school all those many years ago as soon as they got in the car I ask them ‘How was your day’? 9 times out of 10 I get ‘good’ as an answer and at times that was it, conversation was over, either they felt they answered the question, they were tired or didn’t want to discuss. But i wanted to know more than ‘good’, I want to know what happened during class, did they have fun at lunchtime, I want sentences. I soon learnt the key is asking a detailed question and asking why. Typically I chat to the kids about their day on the drive home or we discuss their day while we eat dinner. We always sit together as a family and eat dinner, we have done this since the kiddies could sit in high chairs. Our weekdays are so busy, it’s nice to relax, each and chat together. Sometimes we do have the news on in the background, but other days we have it off if we have something that really needs to be discussed. It’s created an open environment where the kids know they can ask us any questions or tell us about struggles they are having socially or educationally. 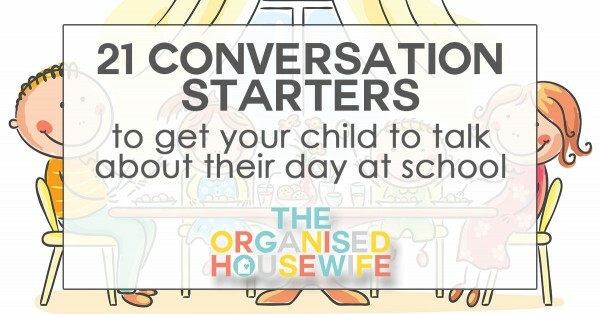 Below I have shared some of our conversation starters to help the kids share more about their day. What was your favourite subject at school today? Why? What was your favourite part of school today? why? What did you do during lunchtime today? How much homework did you get today? What was your favourite food in your lunchbox today? If you could pack your own lunch tomorrow, what would you pack? What books did you read at school today? Did you write a story today? Tell me more about it. Did you play any sports? What did you play? Did anything upset you at school today? is there anythng you learnt at school today that you need extra help with? Which friends did you play with today? Which kids did you sit with at lunchtime? Who are you looking forward to seeing the most tomorrow and why? Who was the friendliest person in your class today and why? Who did you hang out with the most today? 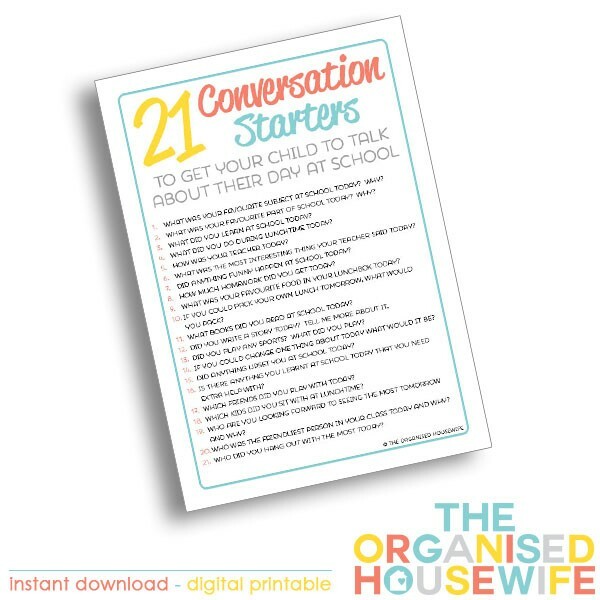 Download the 21 after school conversation starters sheet, use code ‘ schoolchat ‘ at checkout to download for FREE. Download from here. Do you have any tricks to get your child to talk about their day, or questions that can be added to the list? The key is for your kids to sense you are genuinely interested in them and their experiences. Avoid some of the “closed” questions on this list (i.e. questions that can be answered with a single word) such as “How was your teacher today?” (Good) or “How much homework did you get today?” (None). Open-ended questions that invite a story are much more productive. “Tell me about your day today?” “What happened after I dropped you off at school this morning?” or, from the list, “If you could change one thing about today, what would it be?” If kids find a way to answer with a single word to even an open-ended question, then persist, “Tell me more about that?” “Why would you think that?” Once you get your kids talking, make sure you attend carefully, and explore further! Love some of these ideas, especially – What happened after I dropped you off at school this morning. Thanks for sharing Max. I love these questions. I do options for my kindy kid so she can choose which option she liked or wants to talk about. I think the Huffington Post article, linked above, has some great questions. Some are “What word did your teacher use the most today?” “Is there anyone from today that you would send to the moon?” (Good question to determine who your child might be having conflict with). I often ask my kids “What was the worst thing that happened today?” That always gets the conversation going!